Have you ever wished you could remember exactly where you were when you took that beautiful seashore photo? Or how about trying to explain how to get to the perfect picnic spot you discovered along that scenic river? Or, maybe you simply want to get back to that remote campsite where you accidentally left your iPad! If any of those scenarios sound familiar, you are probably a candidate for a GPS-enabled camera. Once you start adding GPS metadata to your photos, you’ll be surprised at all the unexpected advantages it can offer. Years ago, however, adding metadata was at best - a pain. It used to be a matter of carrying a GPS device and then taking readings at each place you took a photo, so you could come back home and try to match them correctly. One lost note and you didn’t know which GPS coordinate went with which photo, not to mention the chance of error when typing in long and cryptic GPS coordinates. Now, that’s all a thing of the past. With today’s accessories and software, it can all be done automatically, or with a couple clicks of your mouse. I recently had the opportunity to test drive a number of GPS devices in conjunction with some specialized software from GeoSpatial Experts in Thornton, Colorado. 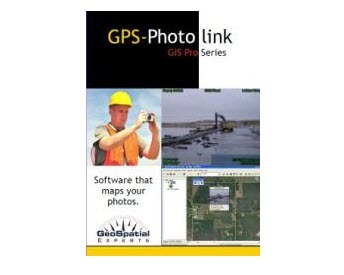 Their GPS-Photo Link software is used extensively by law enforcement, government, oil & gas, rescue and natural resource management groups around the world. With a simple “wizard-like” menu progression, you are stepped through the process and then presented with a wealth of output possibilities. The software packages start around $149 and go up to the “do-all” master package - GIS Pro Series for $349.00. That was the one I used, and I must admit to being quit impressed with all the options it presented. Watch the attached video to see how easily the output files were created. The new version 5.0 outputs to ESRI Enterprise Geodatabases, Access files and PDF files as well as the ESRI Shape Files, Google Earth, Word and Web pages available in previous versions. In addition, the new interface is more interactive, allowing users to apply a variety of mapping functions to their photo project and preview the results on a live digital map before generating the final output. That’s all well and good, but how do you get the GPS data needed to go with your photos, you ask? Actually, there are a number of options. The first and simplest method is to attach a GPS sensor to your camera if there is one available. 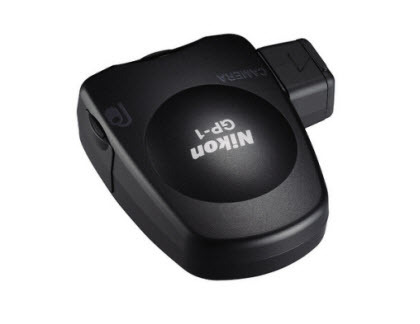 I tested the Nikon GP-1 unit on a number of my Nikon DSLR’s. It was as simple as inserting the unit in the hot shoe atop my camera and plugging in it’s cord to the Nikon 10-pin connector on the front of my camera. Once plugged in, I merely had to wait for the unit to detect the GPS satellites above me, and when the green light came on, I was ready to shoot. Waiting time ranged from 15 to 75 seconds depending on location, cloud cover, etc. Usually it was on the lesser end of that range. The GPS data was then automatically included in each of the photos I shot and was ready for plotting as soon as I downloaded them to my computer. I also wanted to try applying GPS metadata to shots made on my Canon S-90 pocket camera which doesn’t have any hot shoe or connector. Not a problem, according to the experts at GeoSpatial. They had a solution for that as well. By using a separate handheld GPS unit, I merely needed to turn on the unit when I started shooting, and then turn it off again when I had completed my shoot. All the while it was on, it was creating a “log file” of dates, times and GPS coordinates as I traveled about. Once I was back at my computer. I merely attached the Garmin Trex handheld unit via a USB 2.0 cable and downloaded the log file to my hard drive. The Photo Link 5.0 software then matched the times on the log file with the times on my camera’s photos and it knew exactly which GPS data to apply to which photos – no interaction necessary on my part. Gotta love that. No more note-taking and no more mis-applied data. One trick made it all work seamlessly…when you start creating the log file, you need to take a photo of the GPS unit, showing the time-of-day. Later on, the software will offer you the opportunity to match the time shown in your photo with the time shown on your camera. The software compares the difference in the two and automatically syncs the two to give you the accurate location where you were when you pushed the shutter. When you have the need to present your photos with map accurate locations, you’ll have a hard time finding a better package than Photo Link version 5.0. With all the output possibilities this software offers, it’s hard to imagine a need it can’t meet. A free, fifteen-day trial is available as well. Talk to the folks at GeoSpatial Experts to make sure you have the right combination of hardware and software. They offer everything you’ll need from GPS enabled cameras, to GPS add-ons, to handheld units to software. Their tech support is top-notch as well.